I was born in New York City, raised on Long Island, and have lived for the past twenty years in the San Francisco Bay Area. I attended Wesleyan University, got a BFA in Film from New York University, and received my Masters in English/Creative Writing from San Francisco State University. I grew up hearing stories about my Icelandic relatives and their journey to North America, following the 1875 volcanic eruption that decimated much of Iceland's farmland. 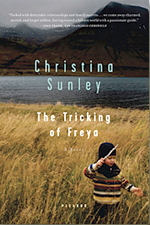 To write The Tricking of Freya, I spent several years researching Icelandic history, mythology, and genealogy, including three trips to Iceland and a stint as writer-in-residence at Klaustrið (The Monastery), a stone farmhouse in a remote area, near where my grandfather had lived. My short fiction has appeared in a variety of literary journals. The Tricking of Freya is my first novel.